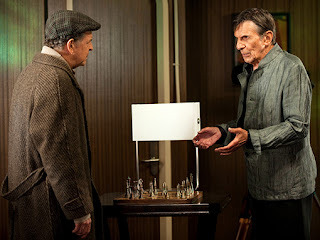 Fringe is known for bleak cliffhangers that set up or tease the next year’s capture-the-imagination sci-fi idea. But the exec producers say that with “Brave New World,” they were going for something more emotional, less mythological. Hence, this year, our heroes got something like a clean victory/happy ending. Walter defeated William Bell’s wannabe god scheme to create a “brave new world” filled with strange creatures (and very few humans), while Olivia cheated death (from a bullet in the head, no less!) with her recently-conceived baby intact. Also: Astrid lives! Wyman calls the episode “the calm before the storm… a gentle closing of the door” to this part of the saga. Read Jeff Jenson's entire entertainmentweekly.com post here. Yes, that's what I also thought that this end of the 4th season was approaching more than one appropriate ending to what has been counted so far in Fringe, no doubt. But this grateful news of Fringe for another season, it was like a real gift to us all. And the continuation of this saga, now compressed in the next 13 episodes to come, will serve to tell us that somehow they "have more stories than we could imagine in Fringe." The episode 4.19 (Letters of Transit), I suppose, was like a sampling of next season, we have, focusing on how the central characters and Etta Simon, I see. I think this next 5th season will be fantastic (as Walter would say), very 'Hi-Tec ", special effects, time crossings, dictatorial observers, the September being a dissident clan observers, Olivia, Peter and Walter "alive" until the end, Simon and Etta are our heroes, these brand new moments that are coming ... Well, actually I know nothing of what is to come, but one thing is certain, we will have a season finale of Fringe, simply wonderful and worthy those implacable universe. And speaking of the universe, would be great if we had the return of "Redverse", is not it? I’ve read in many places quotes from stars and others related to Fringe that we are not going to see the Alternate Universe in Season 5. That would be extremely disappointing. Could Lincoln at least send a text message, send a carrier pigeon through a wormhole, or phone home to say all is well in the AltVerse? Please!!!! The only reason I have a little bit of hope that we will see or hear from AltVerse, is that I believe anyone associated with the show are instructed by the powers-that-be not to give anything away, to be a Spoiler Free Zone, when being interviewed. I am going to think along these lines and hope for the best. I have to agree with you that the showrunners will probably keep the lid on the spoilers sealed tighter than ever in S5. Remember that Joel Wyman told us recently that everything up to this point has been important, and I must assume that would include Team Red, so despite what you've been told, never say never! It’s hard to wrap my head around the fact that there is a possibility we will never see, AltLivia, Walternate, Peter’s mother Elizabeth, our Lincoln and a really important person, Henry the cab driver, one last time.